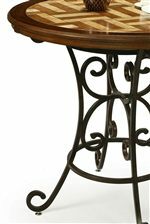 Dress up your dining space with this elegantly refined counter stool. 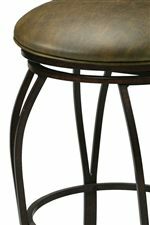 Crafted from iron in a beautiful Autumn Rust finish, this stool features intricate scrolled metalwork on its seat back, making this piece both visually interesting and unique. An upholstered seat cushion ensures long lasting comfort, and with Florentine Coffee colored upholstery, the seat fabric blends perfectly with the metalwork's rustic tones. Scrolled arms lend a sense of flow and movement to the stool, and a swivel base and lower footrest present comfortable conveniences to impress. Emanating a classy, upscale feel without forgetting about traditional comforts, this upholstered counter stool is a lovely piece that is sure to uplift your dining area and home. The Magnolia 26" Upholstered Counter Stool with Arms by Pastel Minson at AHFA in the area. Product availability may vary. Contact us for the most current availability on this product. Arm Features beautiful scrolled metal arms. Leg or Base Swivel base lifted on four gently curved legs with support stretchers and a footrest. Seat Upholstered in a Florentine Coffee fabric. 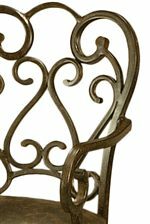 Seat Back Features an elegant scrolled metalwork seat back.